2016. Where should I begin? In between Brexit, Trump and a steady stream of celebrity passings, 2016 has, in many ways, has seemed rather unreal. Who could have predicted this time last year that we would be on the cusp of immense political and social change? For me, 2016 has been a year of great personal and professional change. I am now working as a consultant full time, and this level of freedom has given me the opportunity to explore new work streams and travel the world. 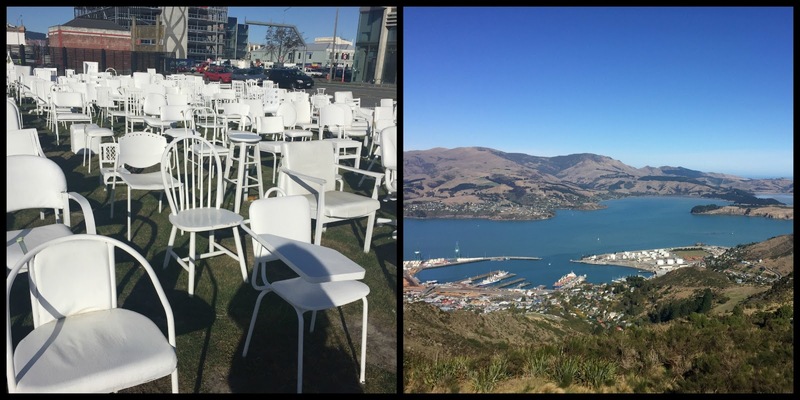 The loss of family members and friends against the many highs has been poignant, but it has focused the mind and put many things into perspective. So without further ado, here was my 2016! I started the year with the news that I was one of Wales Online's 16 in 16 entrepreneurs to watch! A nice way to begin January. During February and March, I began to shift my energy to consulting full time. 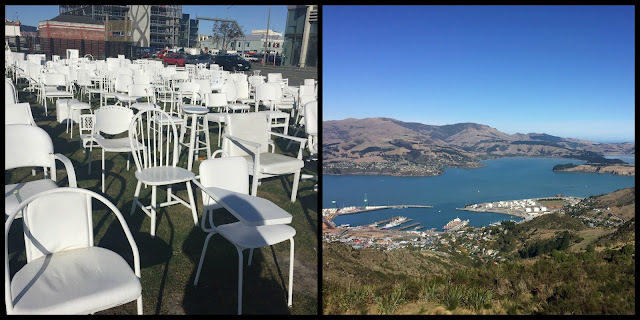 In April, I packed my bags and headed off to Australia and New Zealand for a month. 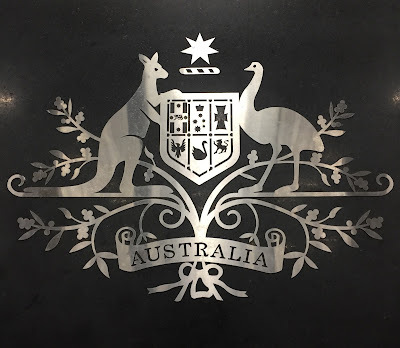 Staying with friends in Sydney, I explored one of my favourite cities, met up with long-last family members, saw the awesome Lego exhibition at the Powerhouse, finally saw the Miss Fisher's Murder Mysteries costumes (fangirl,) and travelled to Canberra to visit the Australian Parliament and National War Memorial. 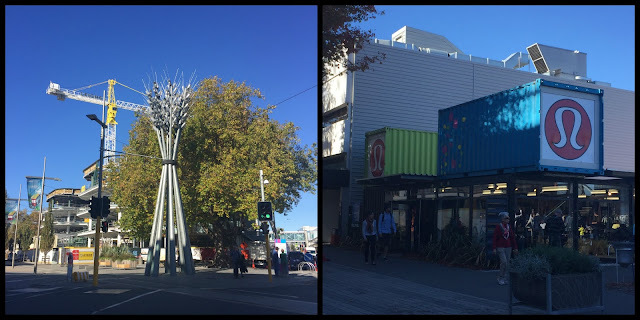 In New Zealand, I went back to Christchurch to see friends and see how much the great city has changed since the dreadful earthquakes. In May, I was back to London to start work on a pilot digital project with Parliament and doteveryone. This was a fascinating experience, and working with MPs, I investigated how they use digital technology and social media to communicate with their constituents, tackle their workload and generally encourage digital democracy and political engagement. 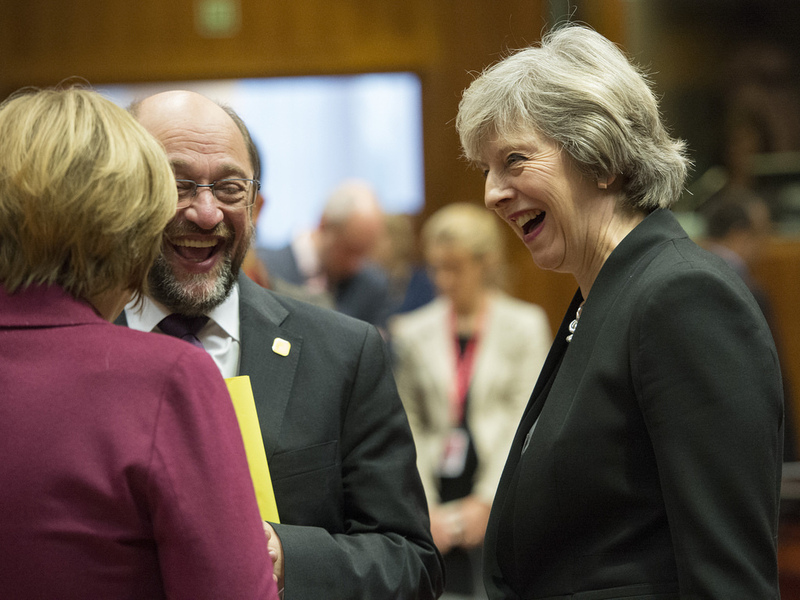 The three month project overlapped with the historic vote to leave the European Union, and to be in the UK Parliament at an immense time of political change was something which we couldn't have predicted. I stood in Old Palace Yard as David Cameron left Parliament as Prime Minister, and watched from the Speaker's Gallery as Theresa May took part in her first Prime Minister's Questions. I visited the HQs of Facebook and Twitter, and attended the American Ambassador's 4th July party at Winfield House. So many great moments and experiences that I won't forget and so many great friendships formed. During the summer I fit in my first trip to Dublin - such a great city! 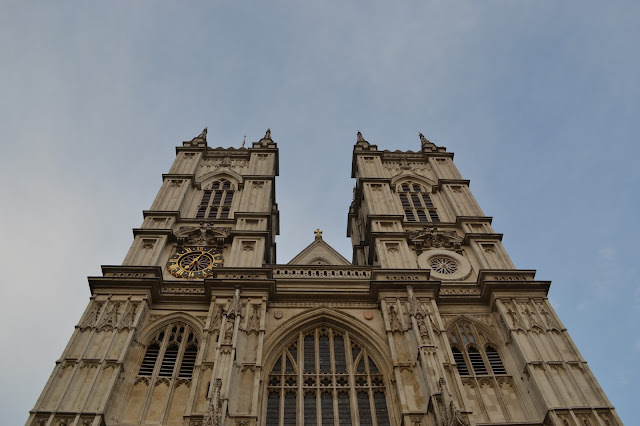 I also spent time rediscovering London and indulging in some quintessential sites including Buckingham Palace and Westminster Abbey. I was also asked to be a godmother to my friend's little girl Emily! Such a privilege and responsibility! As we entered the autumn, I received a nomination in the Entrepreneur Wales Awards and headed back over the Atlantic to New York. 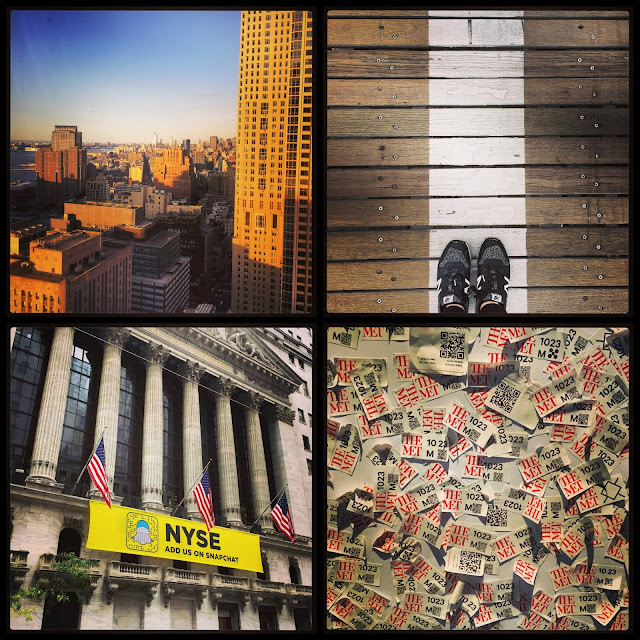 Walking the Brooklyn Bridge, visiting Tory Burch HQ and returning to the World Trade Center Museum and Memorial were some of the highlights of the trip. I also won't forget the mood of anticipation by many that America was on the cusp of making history with the possibility of electing its first female President. How the mood had changed merely a week later. 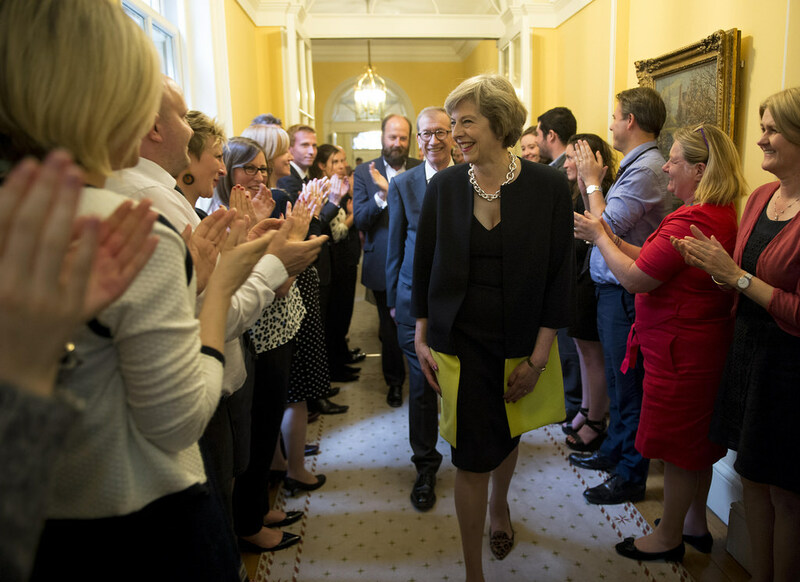 One of the successes of 2016 has been writing about our new Prime Minister, Theresa May for Political Style. 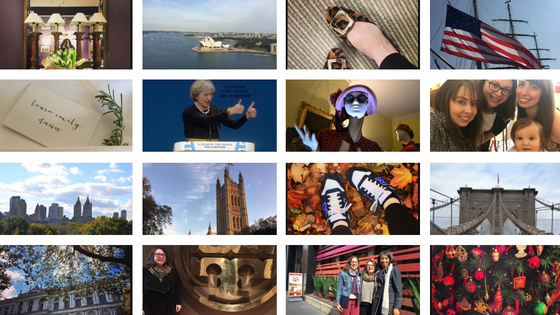 The interest in coverage has been fantastic, and personally, it has been great fun to keep tabs on what she is wearing and create fun content! It has also been amazing to be recognised in the press for my blogging - something which I couldn't achieve without the support of my fabulous readers. Thank you! The end of a year is always a reflective one, and as we head towards 2017, I feel truly blessed and privileged to have had such an extraordinary year. 2016 has taught me to grab all opportunities that come my way, trust my gut, and importantly to try. If you say no you'll never know! Here's to a successful, positive and prosperous 2017 for us all. Make it yours! We know Theresa May is a stylish leader, but what do her sartorial selections really suggest? 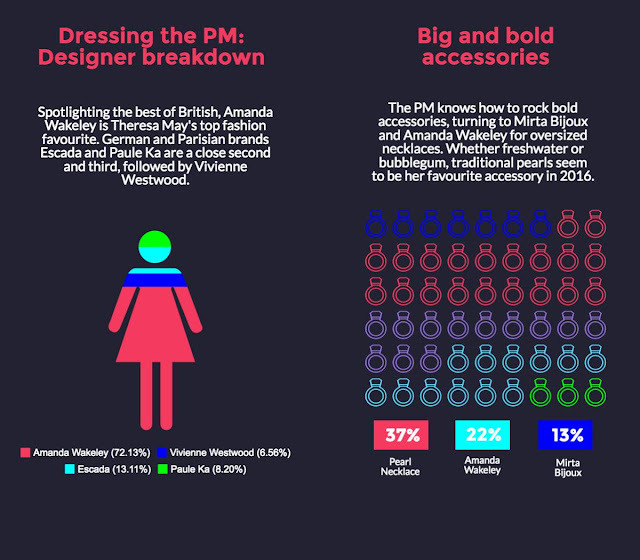 I decided to take a deeper look at the clothes and accessories she has been wearing since becoming Prime Minister. Focusing on public appearances and official photographs since July 2016, I've put together this infographic analysing all of Theresa May's clothes since becoming Prime Minister. From the steps of Downing Street to her Maidenhead constituency, I've taken a look at Theresa May's favourite shoes, her most worn accessories and the outfits she has turned to time and time again. Amanda Wakeley is Theresa May's most frequently worn designer. She has worn a piece from the British legend almost 75% of the time between July and December 2016. 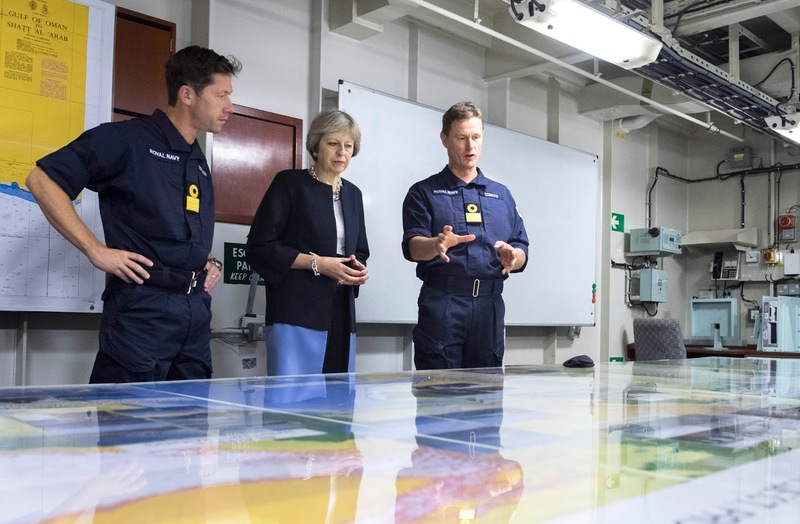 Theresa May's favourite colour is navy. 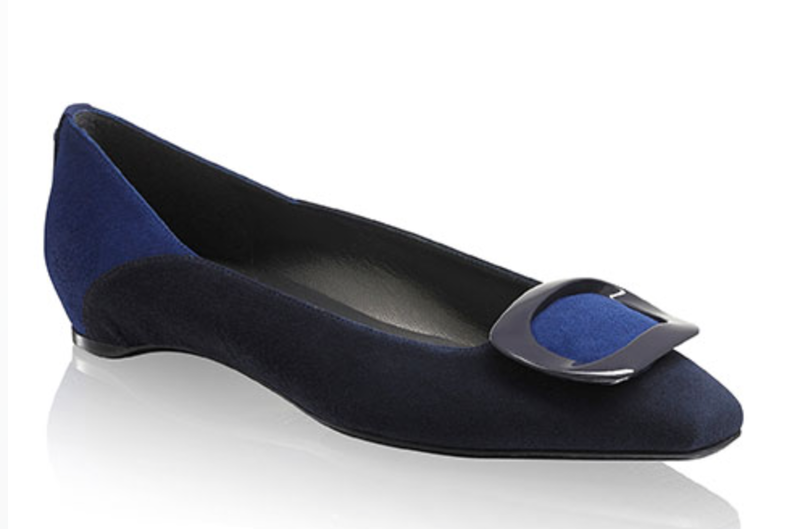 At almost 45%, this 'true blue' staple forms the majority of the PM's tailored dresses and smart suits. 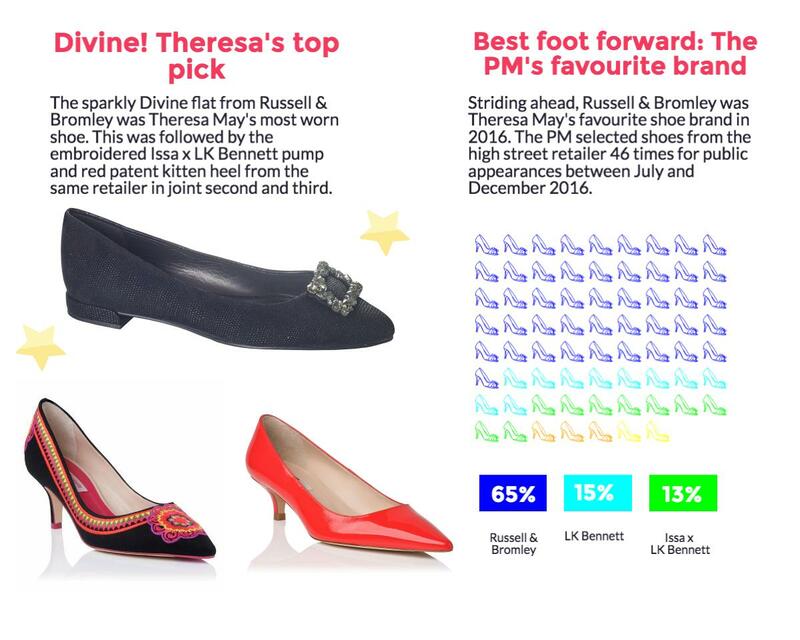 Russell & Bromley wins the battle for the Prime Minister's most loved shoe brand. She wore a shoe from this British institution 46 times between July and December 2016. 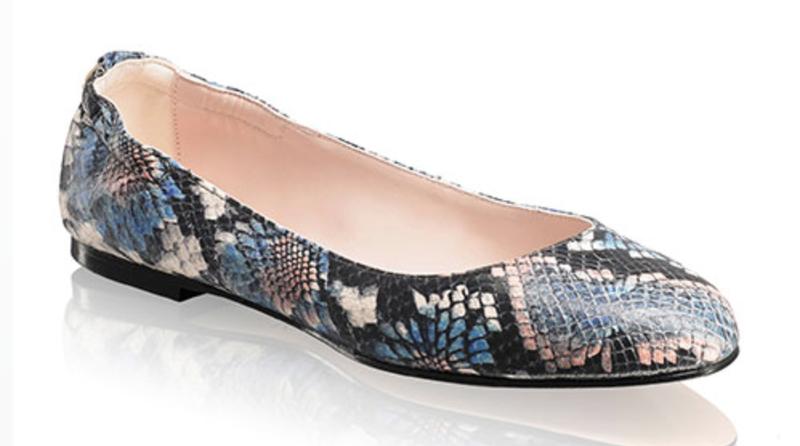 Theresa May wore the Divine flat by Russell & Bromley the most during her first six months as Prime Minister. This was closely followed by the black embroidered heel by Issa x LK Bennett and the red patent Minu kitten heel by the same retailer. And unsurprisingly, Theresa May is championing British designers with Amanda Wakeley, Anya Hindmarch and Halcyon Days as her staples. But what was surprising about the data? Leopard wasn't the winner in the shoe stakes. 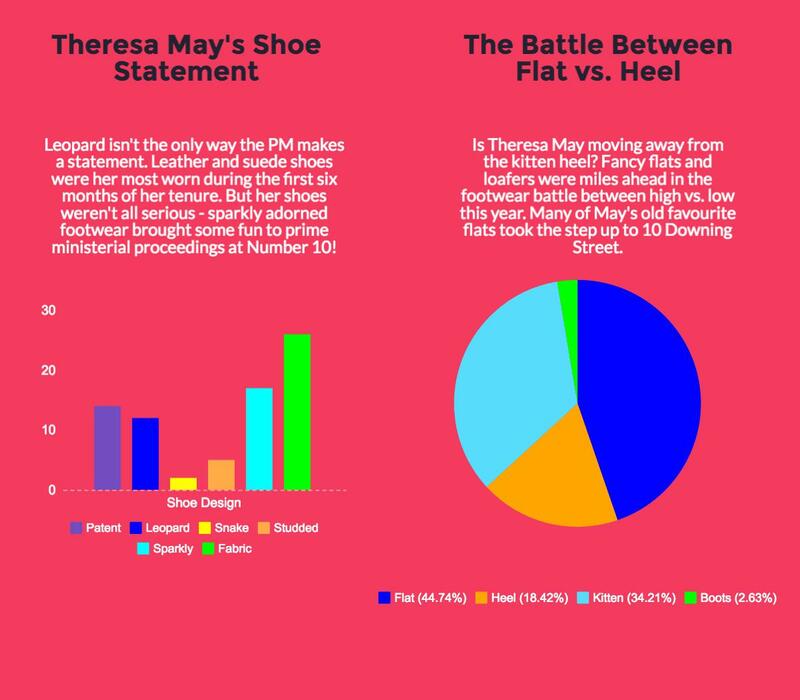 In fact, sparkly adorned footwear and patent numbers were worn more by Theresa May during her first six months in office. And the Prime Minister's trademark kitten heel was also given a rest during July-December 2016. 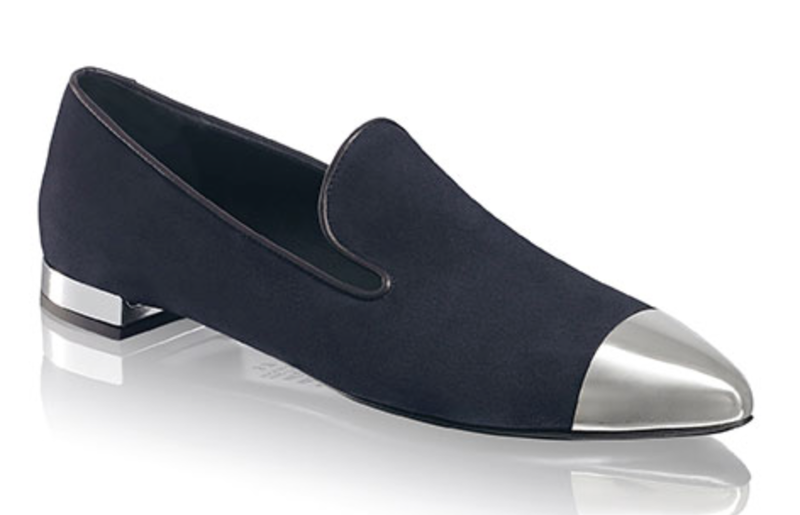 Theresa May wore a range of fancy flats and loafers almost 45% of the time. 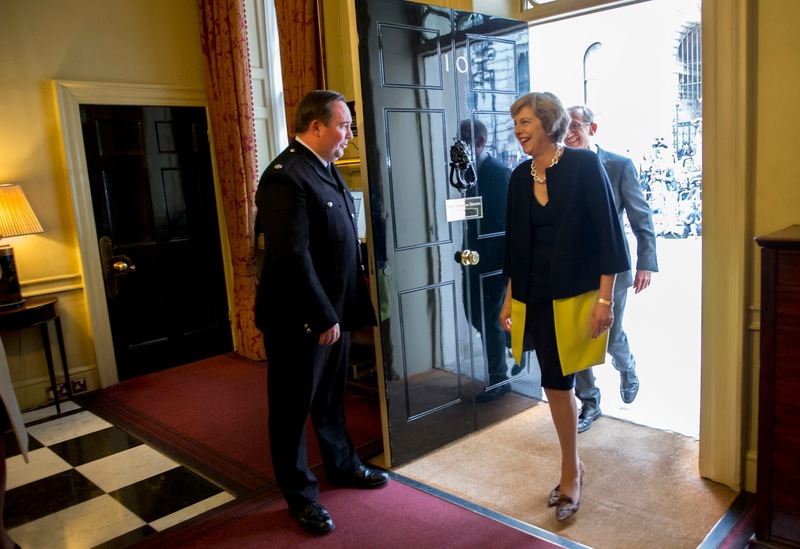 We obsessed about the chunky silver chain necklace by Amanda Wakeley that Theresa May wore when she entered Downing Street. But, the traditional pearl necklace was her favourite accessory during her first six months, with May choosing freshwater or a bubblegum style pearl 37% of the time. So what does this suggest about Theresa May's style since becoming Prime Minister? She is undoubtedly a champion of British fashion and design, relying on established designers like Amanda Wakeley to form the bulk of her wardrobe. She has her staples, and she relies on them for public appearances, state functions and to keep her stylishly chic for the day to day running of the country. 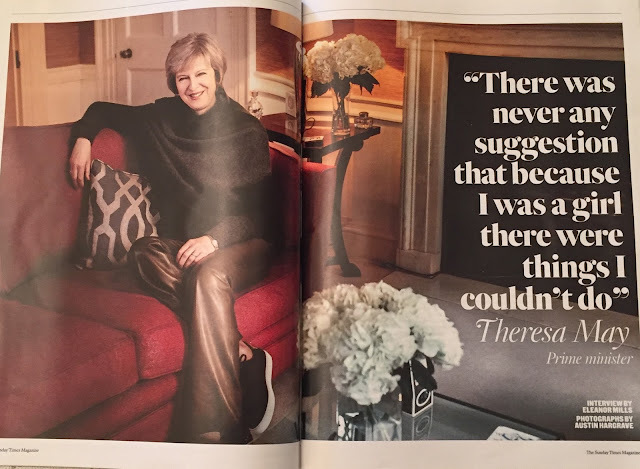 Similarly, May knows what works for her and the prominence of Russell & Bromley for example, shows just how beloved the brand is to our Prime Minister. Whilst May is predictable in her choice of designers and colour palette, she has mixed it up during her first six months in office. The choice of Dolce and Gabbana for footwear to the Pride of Britain Awards and a daringly thigh high cut evening dress by Amanda Wakeley showed just how much fun she likes to have with what she wears. 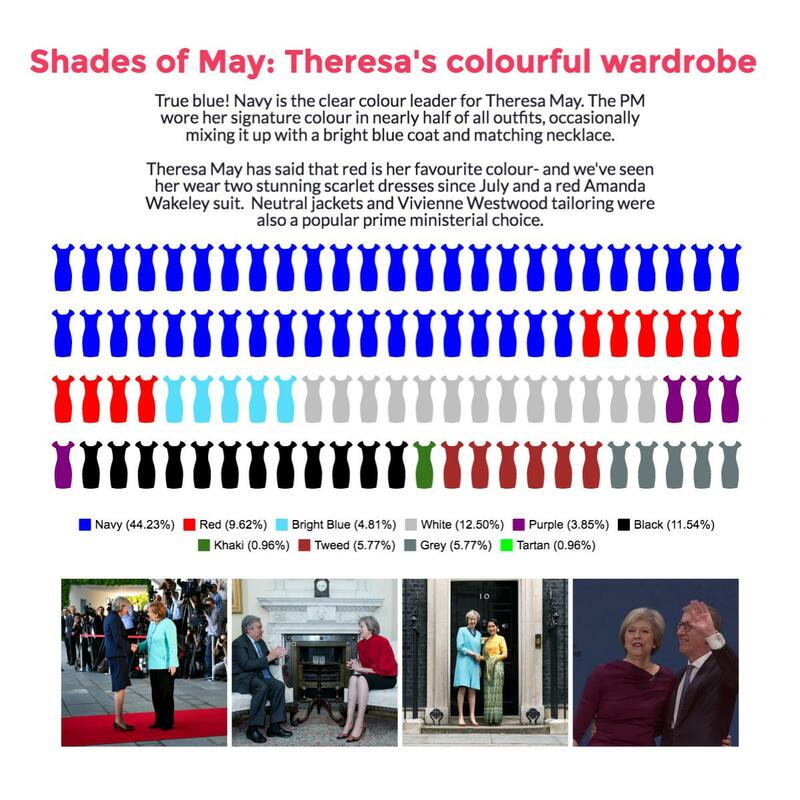 Theresa May has made many a fashion headline since July, and as we enter a new year full of political challenges, perhaps the focus on her clothes will be a welcome respite. As a blogger who has closely followed our Prime Minister's wardrobe for six months, even I was surprised by what the data revealed. Theresa May is an interesting leader and I'm looking forward to seeing what 2017 holds for this fashionable figure. 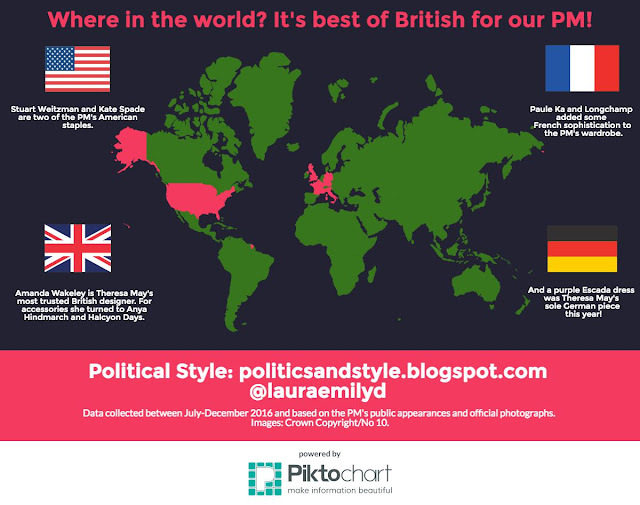 I'd love to hear what you think of this infographic - share your thoughts with me in the comments or on Twitter! View the full infographic here. 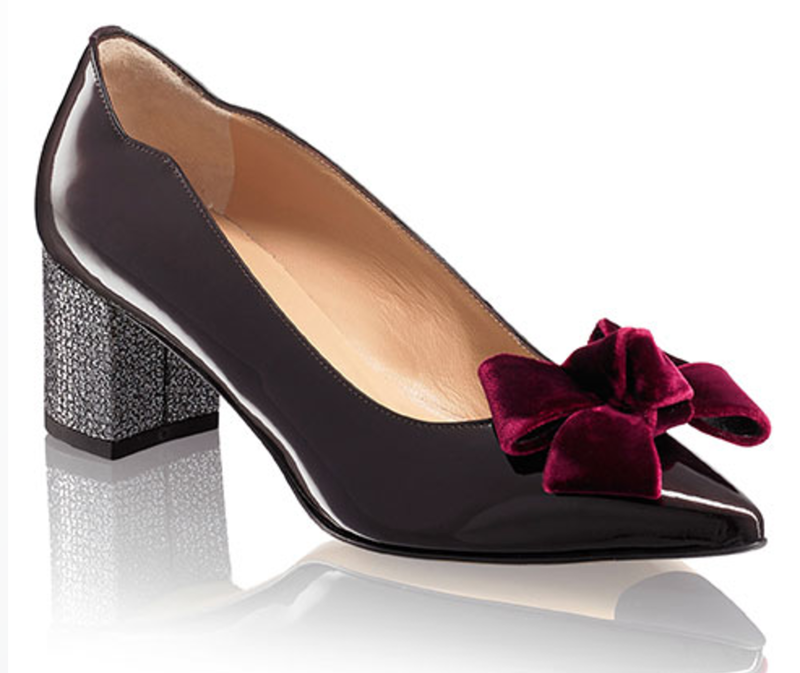 Russell & Bromley has launched its awesome winter sale! And for the first time, you can now shop sale items online! 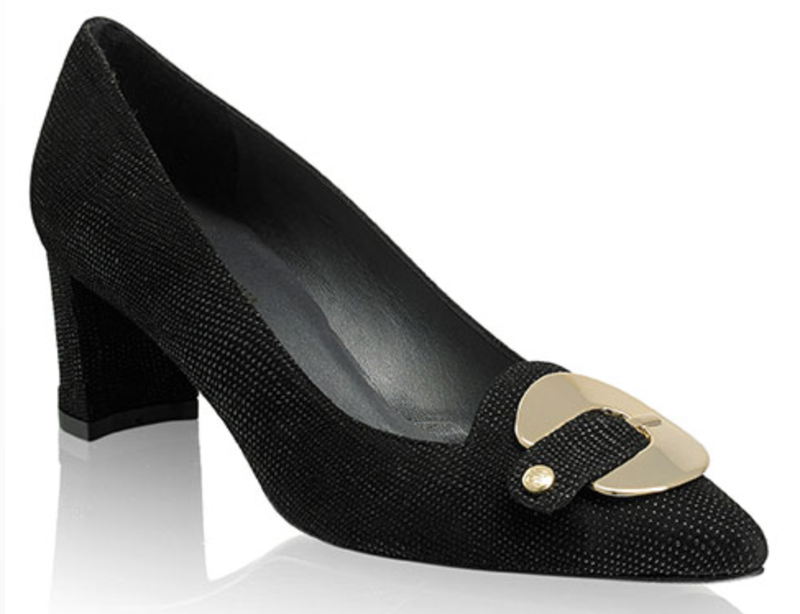 Here are my top picks from their sale- act fast before they go! 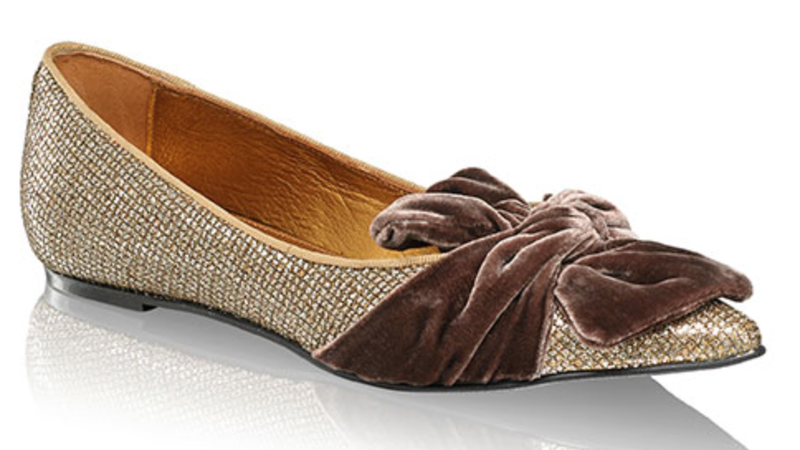 Theresa May's Russell & Bromley shoes on sale! If you've been waiting to snap up a pair of Theresa May's recent shoe purchases from Russell & Bromley then now is the time! The uber cool Charlize metal trim slippers and the Twist Knotted Bow Flat are now on sale. 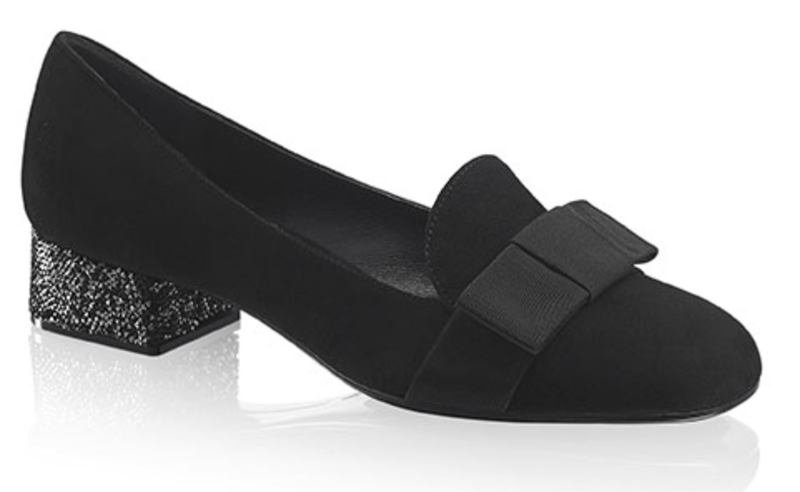 And the Saucy, a shoe she first debuted in 2015 is also on sale. Happy shopping! Theresa May knows how to rock a bold accessory, and she recently wore this gorgeous shawl from Halcyon Days when the Polish Prime Minister visited Downing Street. Any gifts that Ministers receive over £140 have to be publically declared. If Ministers want to keep them, they have to purchase the items themselves or they are kept by the Cabinet Office. 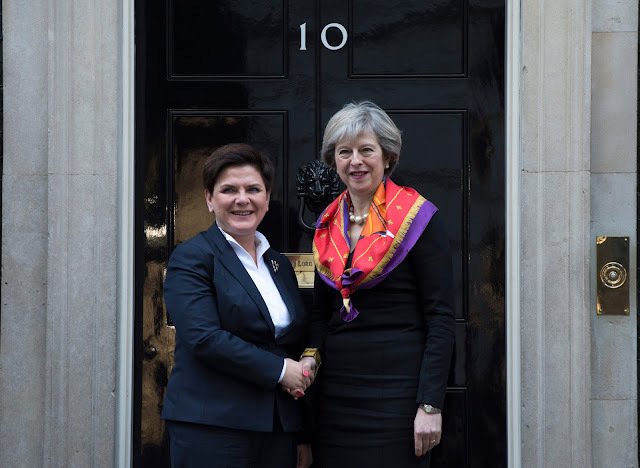 The PM purchased the Halcyon Days shawl herself- a wise move! The shawls by Halcyon Days made from 100% Italian silk and produced in Como. Whilst they are a fantastic style statement, they would also look awesome framed! Whilst Theresa May's particular design isn't available to purchase online, there are some similarly stunning numbers here. It's been a busy week for the PM. 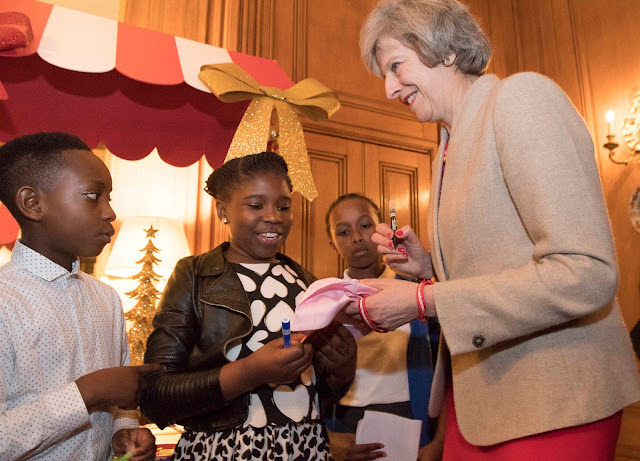 From Christmas parties to the EU Council meeting, here's what Theresa May has been up to. On Monday, Theresa May welcomed children to Number 10 as part of the annual children's Christmas party. Later in the week, the PM participated in the last PMQs of 2016. 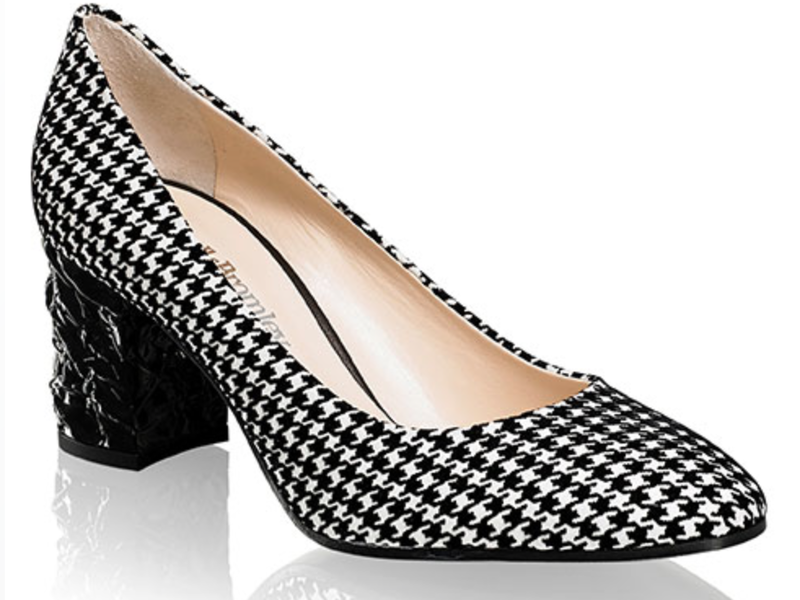 Sharp navy suiting and the patent Vivacious block heels from Russell & Bromley were her look at the despatch box. 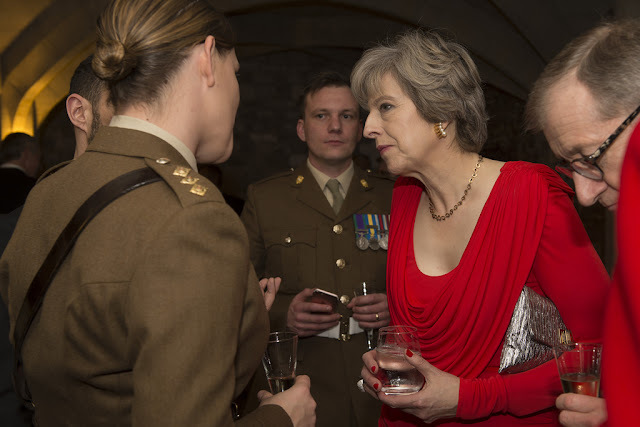 On Wednesday evening, Theresa May and her husband Philip attended The Sun Military Awards at Guildhall, in the City of London. The PM turned to Amanda Wakeley, wearing a striking draped red jersey dress for her festive look. Patent red pumps from LK Bennett and the silver lame Valorie clutch from Anya Hindmarch were her chic accessories. 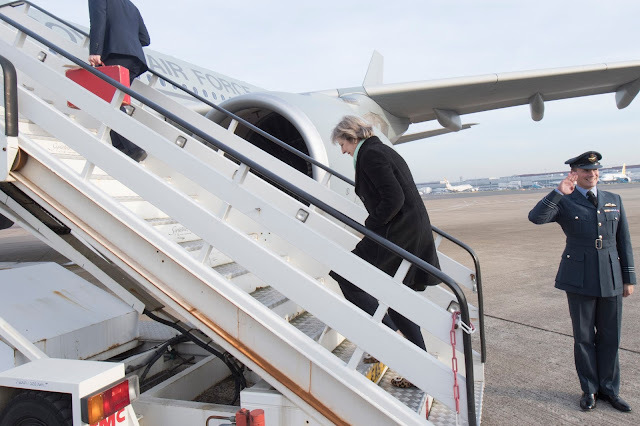 And on Thursday, the PM travelled to Brussels to participate in the EU Council meeting. Meeting with various government leaders, Theresa May wore an Amanda Wakeley suit, the Divine flats from Russell & Bromley and accessorised with an Amanda Wakeley oversized chain necklace and the Redford Black Leather Shoulder Bag from the same designer. You've got the big gifts sorted, but what about those little extras? I often find these are the most stressful to pick! But do not fear, with my suggestions your last minute stocking stuffers will be the sparkliest this season! Made in the UK, Novel Beauty is one of my newest discoveries. 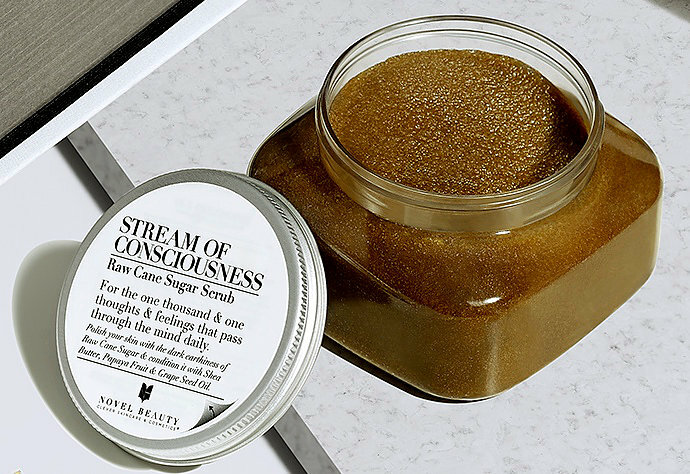 This Raw Cane Sugar Scrub contains Shea Butter, Papaya Fruit and Grape Seed Oil for the softest skin. 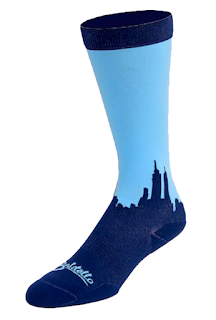 Guys are tricky to buy for, which is why I am a big fan of subscription gifts. Balitello is a fun one - your recipient will receive a new pair of socks each month- and they have some great designs like this New York skyline pair! I'm particularly fond of a fun accessory, and this silver fox keychain by Amanda Wakeley is one of the coolest and most elegant I've seen! You can't go wrong with an oversized necklace- well done J.Crew! 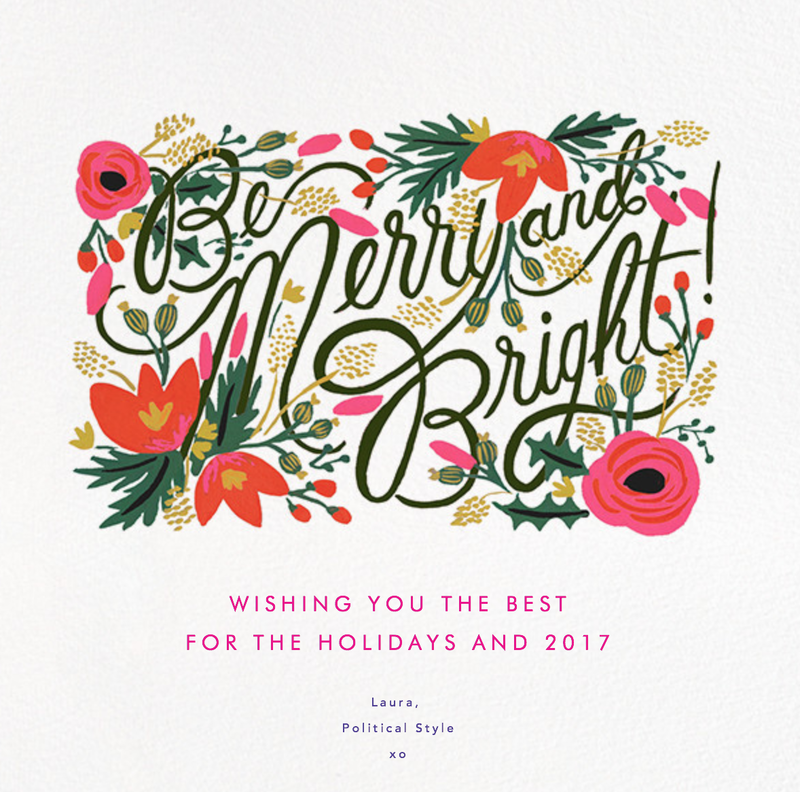 For more gift ideas check out my 2016 Gift Guide! I've been on a Pinterest break of late, but I am now firmly back in the game! If you're not already following me, have a scroll through some of my boards below! Jo Malone is one of Britain's well known and best loved entrepreneurs, synonymous with the Jo Malone fragrance line which she sold to Estee Lauder in 1999. Jo has been responsible for revolutionising the world of fragrance, and has just released her auto-biography, My Story. In 2013, Malone opened her first 'Jo Loves' fragrance store on Elizabeth Street in Belgravia, in a full circle journey to where she began her career as a florist just aged 16. Jo was honoured with an MBE in 2008 and continues to help aspiring businesswomen through her weekly business advice column, 'Ask Jo' in the London Evening Standard. This book is extra cool because of its scented page! The ultimate scratch n' sniff, you can experience the clean, grapefruit citrus scent of Pomelo whilst reading Malone's inspiring auto-biography. As an entrepreneur, Jo's journey is particularly inspiring, and it is a real joy to find out more about the face behind the fragrance. Thanks to Simon & Schuster for sending me a copy of My Story to read. Today's Sunday papers are full of discussion about Theresa May's leather trousers, and the subsequent comments and fallout between ex Cabinet Minister Nicky Morgan and one of May's key advisors. In my years as a blogger covering the fashion choices of our politicians, I have never known so many column inches dedicated to one single item of clothing. Even without the drama surrounding Morgan's comments, the khaki leather trousers from Amanda Wakeley would be a conversation starter. 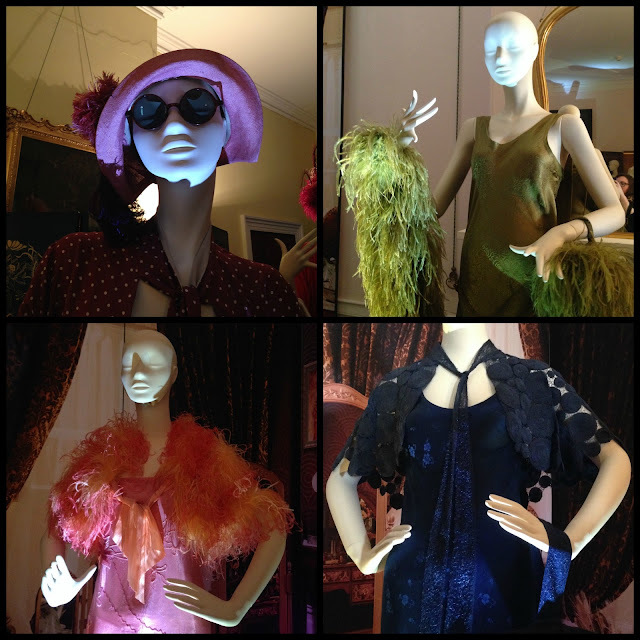 They're fashion forward, and to wear them, the individual needs to be bold, confident and unafraid of making a statement. The Prime Minister is each of these things. And, as a leader only six months into the job, we are still fascinated to find out what makes her tick. Fashion is clearly one of her passions, and as our leader on the world stage, we are interested in what she is wearing and how she will champion British designers. As a fashion blogger, I'm interested in May's clothes and the choices behind what she picks. At a recent roundtable event, an individual asked me why I don't blog about male clothes. Honestly, changing from a navy to grey suit doesn't have that same level of interest- and it's not going to make the front pages. There is always going to be a level of fascination with what a female politician wears, and frankly, we'll never get away from this. May loves fashion and what she chooses to wear is her business. 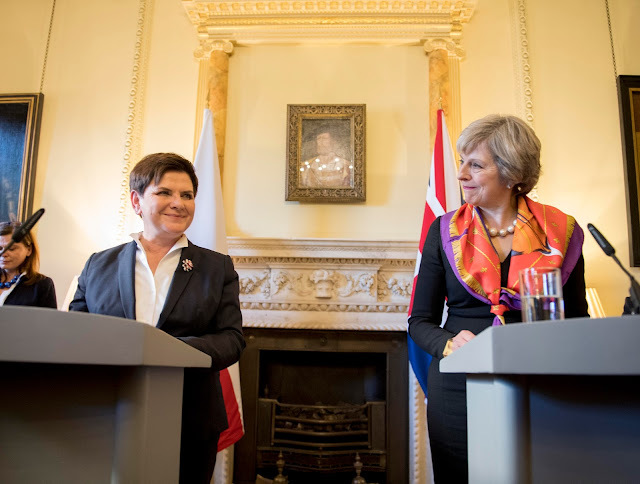 Whether it's a jacket from Marks & Spencer or a dress from Amanda Wakeley, we'll always be interested in the Prime Minister's sartorial selection. This interest in fashion won't detract from the key task of how May and her Government will lead the country through Brexit and determining Britain's future. 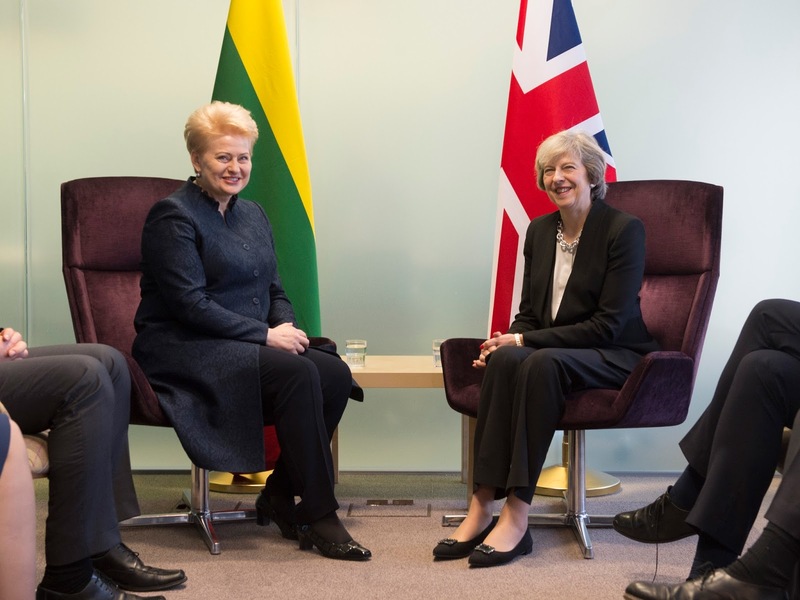 Prime Minister Theresa May attended the annual meeting of leaders from the Gulf Co-operation Council. She was the first British Prime Minister and only the third Western leader to be invited to attend and address leaders at the summit. She was also the first female leader to attend and address the Council. The PM met with leaders from countries including Bahrain, Kuwait, Saudi Arabia and Oman during her three day visit. 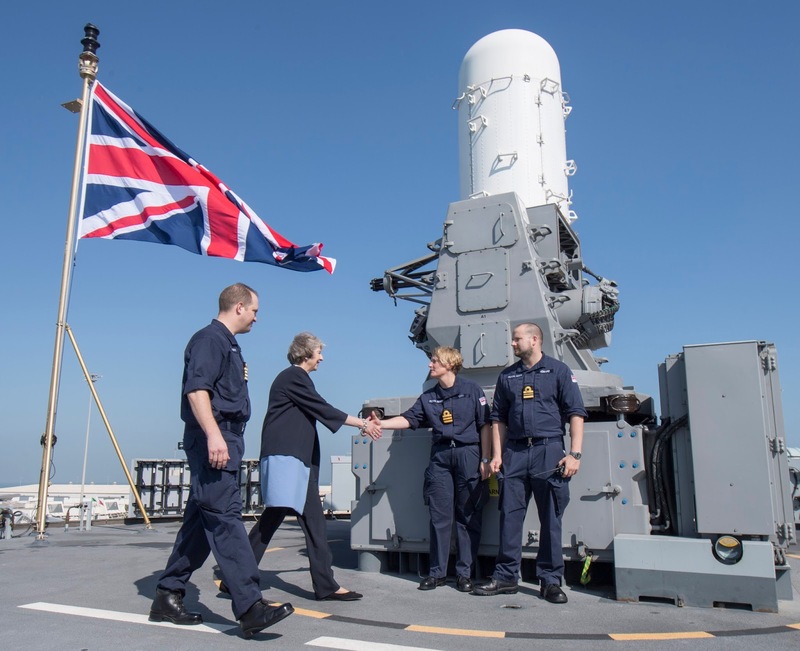 She also visited HMS Ocean and its crew at the Khalifa Bin Salman Port in Bahrain. During the first day, the Prime Minister wore an Amanda Wakeley navy and sky blue coat with matching trousers and jewelled black flats from Russell & Bromley. Mrs May also met with young leaders at a special reception at Riffa Fort. Here she wore a striking pink silk suit, the jacket with a Mandarin style collar and a gold embroidered floral pattern. On the final day of her trip, the Prime Minister attended and addressed a plenary session of the Gulf Cooperation Council summit. She wore a striking pale pink tweed coat/jacket, with navy trousers and a pair of Twist gold velvet bow flats from Russell & Bromley. For more details on the PM's trip to Bahrain and the announcements around trade, defence and security click here. I've spent a fair amount of time working in London this year. But aside from the early mornings and late nights, I've managed to explore parts of the city and visit attractions that I haven't got to before! As part of the AccorHotels '24 Hours In Campaign' I'm sharing what I would visit and see over a day in London. You too can take part in the campaign and enter the competition to win a 9 day European break, with stops in Paris, Amsterdam and Berlin! Click here to find out more. Here's how I would spend 24 Hours in London! 9am: Enjoy a leisurely breakfast at my hotel base- I like to stay at the Doubletree Hilton Westminster. Great location, facilities and fantastic customer service. 10am: Set off for sightseeing! I'll take the short walk from the hotel to visit my old stomping ground, the Houses of Parliament. A tour of the Palace of Westminster is not to be missed -my favourite part is the Commons chamber. 12pm: After absorbing a tonne of history, refreshments are required! After a quick coffee pit stop, I'll head up Whitehall to visit the National Portrait Gallery. It has one of the best gift shops in London! 1.30pm: Time for lunch. I'll visit one of the many restaurants tucked off Piccadilly. Or, I'll pick up a healthy salad at Whole Foods. 2pm: Refueling done, I'll indulge in a little retail therapy on Regent Street. 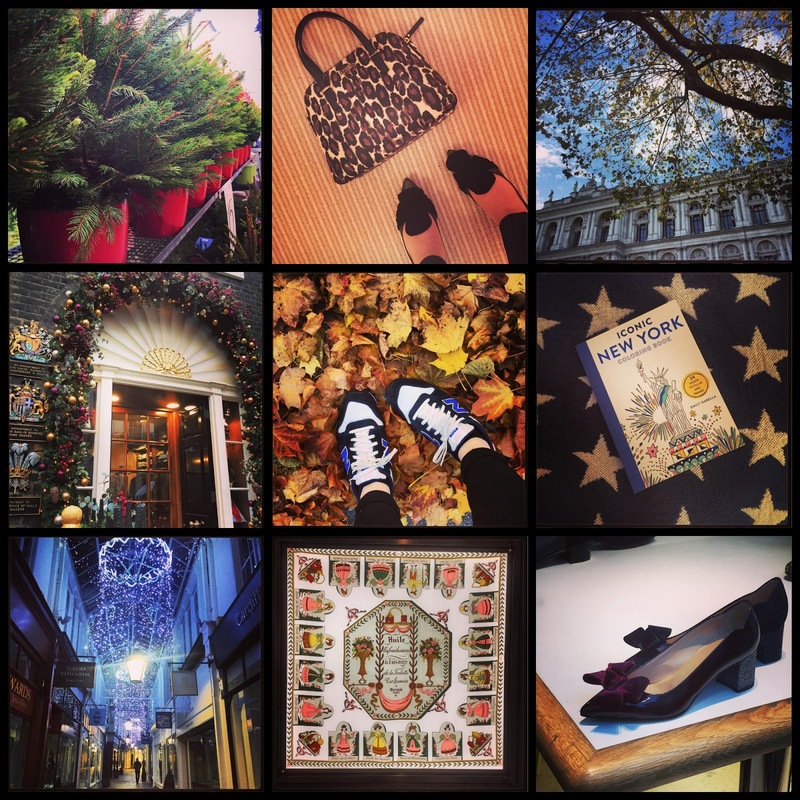 I'll visit my favourites- Russell & Bromley, J.Crew and Uniqlo as well as checking out the new Tory Burch store! 5pm: I'll head back to the hotel for a little rest and relaxation... and to check out the damage done on my credit card! 7pm: After getting ready, I'll jump in a cab and make my way to The Delaunay in Aldwych for a fantastic evening meal and a few cocktails at the Savoy! 10pm: Walking off calories consumed, I'll take in the sights of the London skyline and magical Westminster along the River Thames. 11pm: Back at the hotel, I'll catch a quick night cap in the Millbank Lounge before heading for some rest and an early wake up call! Which is your favourite city and how would you spend 24 hours? Don't forget to take part in Accor Hotel's '24 Hours In Campaign' challenge!